Identify White-winged Scoter - Ducks - Wildfowl Photography. Male - The male White-winged Scoter has an all-black plumage with a white crescent patch below the white eye, a black beak with yellow-orange sides from the nostrils to the tip and sometimes a black nail, a knob at base of the beak, a white speculum, and reddish-orange legs and feet. 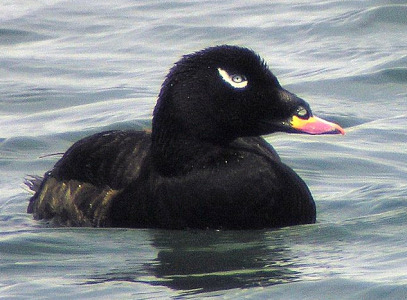 The male American White-winged Scoter (Melanitta Deglandi Deglandi) has browner flanks, mostly dark-yellow beak, and smaller knob on its beak than the Asian White-winged Scoter which has a mostly orange-yellow beak and very tall knob at the base of the beak. Female - The female has a dark-brown plumage, brown eyes, dark-grey beak, and white patches near the beak and ear coverts. Size: - Typical Adult is 48-61cm (19-24in). Food: - Mainly molluscs and crustaceans, small fish, aquatic insects, larvae and also aquatic plants. 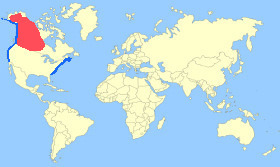 Habitat/Range: - Freshwater lakes, and pools in arctic tundra, and boreal forest, wintering along the coast. It breeds in Alaska and Canada and winters on the coasts of southern Canada, and the USA. Breeding Season: - Begins late May to June. Eggs: - 5 to 11 (Cream, pinkish or pale buff colour). Notes: - The White-winged Scoter is a large sea duck which form large flocks over coastal waters during the winter. There are two sub-species: the American White-winged Scoter (Melanitta Deglandi Deglandi),and the Asian White-winged Scoter (Melanitta Deglandi Stejnegeri).